Line 1-quart bowl with plastic wrap. In food processor, place Cheddar cheese, blue cheese, 1 package softened cream cheese, the bacon bits, onions and pepper sauce. Cover and process, using quick on-and-off motions, until thoroughly mixed. Press cheese mixture into bowl. Cover and refrigerate at least 4 hours but no longer than 48 hours. Invert cheese mixture onto upside-down glass plate or pie plate, forming igloo shape. Remove about 2 tablespoons cheese mixture from one side to make 2x2 1/2-inch arched doorway. Cut two 3/8-inch slices from end of block of firm cream cheese; reserve. Beat remaining cream cheese and the milk with electric mixer on medium speed until blended and smooth. Frost glass plate and igloo with cream cheese mixture; smooth with spatula. Draw lines across igloo, using toothpick, to look like ice blocks. Cut each reserved cream cheese slice into 4 rectangles. Use 6 to 8 rectangles to form door canopy. Cover loosely and refrigerate until ready to serve. To serve, cut flag shape from carrot curl and secure on toothpick; insert into top of igloo. 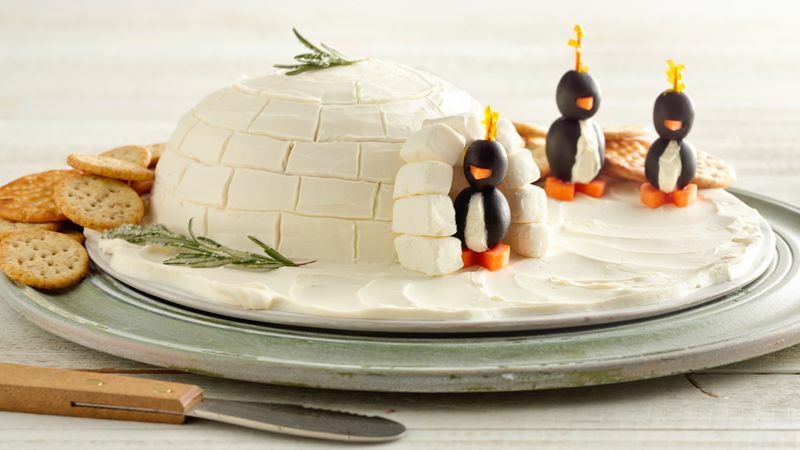 Garnish igloo with rosemary, bell pepper and cream cheese penguins. Serve with crackers. Maintain the North Pole theme by accompanying the edible igloo with blocks of blue gelatin. This recipe works best with full-fat cheese. Low-fat and fat-free varieties can be too soft, making it harder to preserve the structure of your Arctic architecture!